Human trafficking is slavery. We may think of it as something that happens to individuals in poor nations, but the truth is, it can happen to individuals anywhere, of any ethnicity, age, and socio-economic status. Prompted by Hollywood, our minds immediately think of the underground world of prostitution rings and drug cartels; but sadly, it is possible that persons who employ domestic workers or companies who exploit illegal workers may also be engaged by extension in human trafficking pursuits. Individuals who are enslaved by human traffickers lose their independence and are forced to share their hard-earned money with their abuser. They also lose their health. I'm sorry to place such a deep and dark subject on a website devoted to optimism. 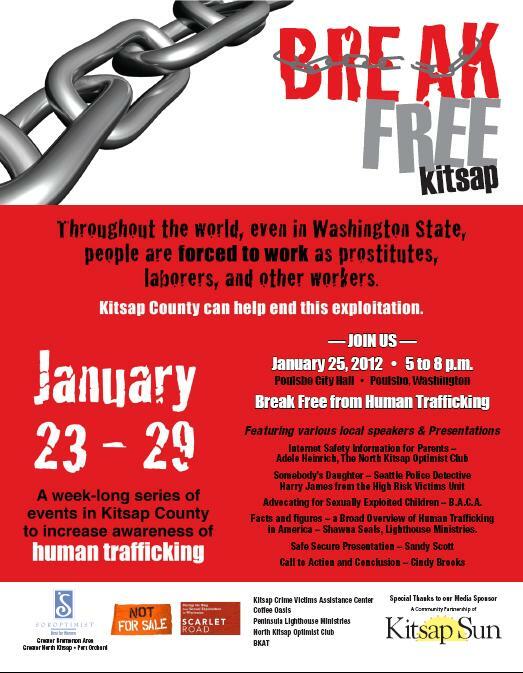 However, raising awareness for causes that will protect our children is a function of an Optimist Club and that is why the N. Kitsap Optimist Club, in conjunction with Break Free Kitsap and others, is conducting a week-long series of events to increase awareness of this horrible crime. For their active part in the series, the N. Kitsap Optimists will present the Optimist International Internet Safety Program for adults and share copies of The Optimist Creed. Other activities include "Somebody's Daughter," a presentation from Seattle Police Detective Henry James, an overview of the extent of the problem, a presentation on Safe Secure and a call to action. Adele Heinrich invites all PNW Optimists to participate, especially those who live in the Seattle-Tacoma area. Shawna Seals with The Poulsbo Inn will offer a reduced rate for Optimist volunteers to stay overnight. Call (360) 779-3921 and ask for Shawna directly. Good luck, Adele and the Kitsap Optimists, on this ambitious program.